My Birthday – Clara & Co.
December 14, 2016 May 4, 2018 Posted in LET'S CELEBRATE! Isn’t it all so amazing? 😀 I was so shocked and thrilled!!! Oh, and one more thing – LOOK AT THESE CUPCAKES. My sister made them. She’s an absolutely unbelievable cook, meanwhile I can’t even make an edible pan of brownies. XD Thanks so much for making them, sister dear! oh, and congrats on 180!!! My word those pictures are so cute! And the cupcake holders are amazing too! One of my friends had a HP birthday, but it was stuff they bought at the store. These homemade decorations are so much more cute and fun! I hope you had a great Happy Birthday!! Your family did an amazing job on your party! And the Dumble Door . . . XD Congrats on 180 followers! You deserve each of them and so many more. Happ birthday to you, happy birthday to you, happy birthday dear Clara, happy birthday to you! And many more! Those decorations looked AMAZING!!!! Can you please pretty please do a review of those cute Our Generation doll pajamas you got? You’re welcome. Great, thanks so much! I definitely had a great day! Thanks! Happy birthday, Clara! You’re a sweet blogger friend 🙂 God bless, and have a joyful day! Happy birthday! That looks awesome. When I was eleven, my uncle sent me a Hogwarts letter, but I hadn’t read Harry Potter so it didn’t make any sense to me. I’m in the middle of Order of the Phoenix right now, but I’m not allowed to read the last two. HAPPY BIRTHDAY! Oh, that’s SO amazing! And I LOVE that Luna shirt. Happy birthday, Clara! XD Congrats on all those followers! Happy birthday Clara!!! That’s so cool!! The Dumble Door was awesome!! The OG pajamas are adorable!! 🙂 I Hope you have/had an AMAZING B-Day! Mmmm the cupcakes look delicious! I can’t believe your sister made them! She looks to be only about 7 from the picture you showed on her B-day post. Oh okay! She’s a great baker! Did you get to take today off since it’s your birthday? Oh okay! That’s good you got it off though! Thank you, Bella! Oh, that’s cool! Happy late Birthday! I didn’t understand the decor either, but the cupcakes looked delicious!!! 🙂 Mmmm! Happy birthday! Love your decorations and your cupcakes! Hope you had a great day! And also wishing you a happy week, month, year! HAPPY BIRTHDAY CLARA Wishing you a day of joy and a year of blessings. HAPPY BIRTHDAY CLARA Enjoy your book haul. looking forward to hear the books you purchased. Thank You for sharing your special day . Erm. HAPPY BIRTHDAY TO YOU, HAPPY BIRTHDAY TO YOU, HAPPY BIRTHDAY DEAR CLARA, HAPPY BIRTHDAY TO YOU! Oh my goodness, I WANT A BUTTERBEER CUPCAKE. Happy Birthday, mines on New Years Eve! Your birthday sounds so fun! 😀 Happy (belated) birthday! 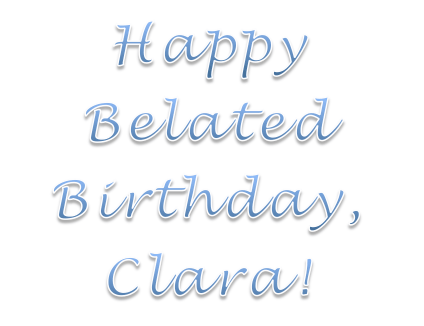 Oh my goodness, happy belated birthday, Clara!